Stay organized and easily keep track of all the screws when servicing an iPhone 4. Keeping track of 20-30+ tiny screws while servicing an iPhone just got a lot easier with the iScrews Service Management Tray. 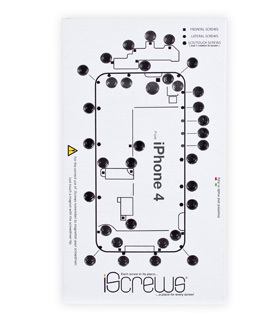 The iScrews' cardboard tray features an illustrative diagram of the iPhone 4 with individual screw compartments located near their service locations to help you easily track and manage these screws during servicing. While the iScrews Service Management Tray for the iPhone 4 is a great and affordable guide for one-time repairs, its durable, lightweight cardboard can also be saved for repeated use on future repairs to keep service screws safe and organized.